One-third of the force can be hand-carved, speed 3-5 times were carved, without fatigue. 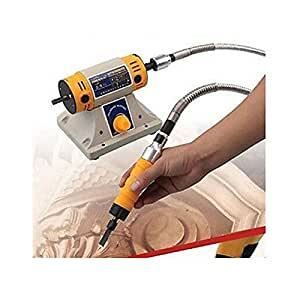 The new wood carving chisel, chisel instead of the traditional hand-carved, is now entering the electric era; rate several times higher than the hand-carved, saving time and effort. Segment produce ultra high speed vibrating 25,000 times per minute after minute touch wood, this ultra high-speed vibration for carving. In addition to general timber, but also can be carved ebony, soft plastics. Shell is solid, excellent thermal efficiency, very safe. Professional engraving, amateurs, students can use. Even touch of a finger tip to vibrate, it will not hurt your fingers cutting. With five specially designed according to the customers reflect the blade 🙁 with five knives shape now is: V-type one, a handful of oblique knife, half a knife, a knife Xiaoping, Ohira a knife). machines containing shaft speed not higher than 12,000 rpm machine can use Oh! ! Mainly used for wood, furniture, sculpture, antique floor sculpture, potted plants, toys, figures, animals and other sculptures.